We moved to Marina Vallarta in Puerto Vallarta, Mexico in 2001 after selling our photography Studio, Mar Del Photography, in Sandy, Utah which operated for over 30 years. Dale is a Certified Master Photographer and we have traveled throughout the World with our photography. 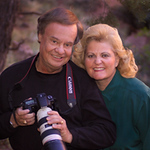 Dale's images have been published in numerous books and periodicals including the National Geographic, World Book, National Audubon, and the cover of The Professional Photographer. He has received many awards including three Kodak Gallery Awards. His work has been displayed throughout the country, including three exhibits at the Walt Disney Epcot Center. We have four children and fourteen grandchildren. In Puerto Vallarta, we are active in the Navy League and the International friendship club and have helped with, and participated in many charitable events in Marina Vallarta and Puerto Vallarta. We have been fortunate to make many new friends from all walks of life. We have both become much healthier individuals since moving to Puerto Vallarta. We fell in love with Puerto Vallarta when we first started vacationing here over 35 years ago. We visited many other locations in Mexico but nothing came close to Marina Vallarta near Puerto Vallarta. The climate is perfect for most of the year. The people are friendly and the town has a true Mexican charm not experienced in other areas built to accommodate tourists. Marina Vallarta and Puerto Vallarta are as safe, or safer, than most cities in the States or Canada. We feel safer here than in any city in which we have lived.